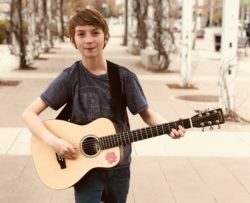 We first cottoned onto Henry Zoellner during an elementary school talent show in which the young singer/multi-instrumentalist gave a stunning performance more evocative of a professional touring artist than a young, aspiring musician from Tulsa. He was given his first full-size acoustic drum set at age 5 and has since learned to play keys, ukulele, bass, electric and acoustic guitars. As a 5th grader at Lee Elementary School, Zoellner is a member of the choir and bike clubs. If Henry isn’t playing music or learning a new song, his favorite past time is watching concerts. We are proud to present Henry Zoellner at his first professional gig.